I was struggling to pull together a seasonal salad with apples, debating almonds versus walnuts, orange or lemon juice, cheddar or Roquefort…Everything seemed to work once I had decided to challenge myself to make a salad using only ingredients found in the fridge or pantry – no shopping allowed! I threw together this impromptu winter salad and it was a big hit at our house! Our navel oranges and Meyer lemons are finally ripe, and I was given a pomegranate from a neighbor who has a tree. 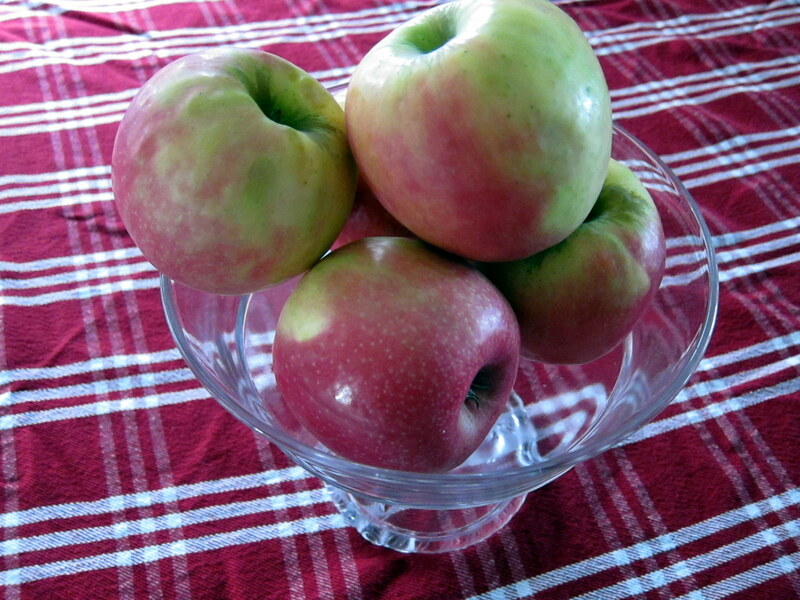 The fruit bowl was full of Pink Lady apples from last week’s Farmers Market, so I was good to go. 1. Heat a small, dry skillet and gently toast the almonds until they turn light brown, about 5 minutes. Set aside. 2. In a small, deep bowl whisk together the walnut oil and the lemon juice. Whisk in the honey and grated ginger. Set aside. 3. Cut the apple into quarters and core. Thinly slice the apple and place the slices in a shallow bowl. Cover the fruit with the orange juice. 4. 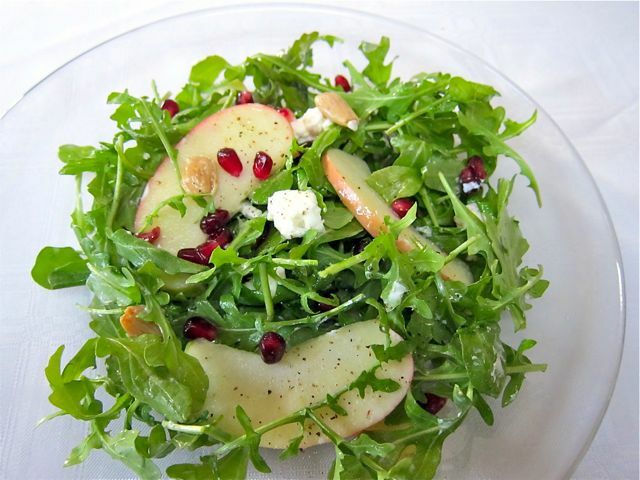 Add the arugula to a salad bowl. Crumble in the goat cheese. Add the sliced apple, toasted almonds and pomegranate seeds. 5. Add the vinaigrette to the salad. Grind in black pepper to taste. Toss and serve immediately. I made it again using apple cider vinegar instead of the Meyer lemon juice – a nice variation. I have never tried adding meyer lemon to a vinaigrette – I love this salad. This salad sounds delicious….and I can’t stop looking at your beautiful photograph!! Lovely to hear from you – how has the climate affected your business?